Over the past some years, mailbox theft has become a serious issue in the world. However, the majority of the people doesn’t take it seriously and that’s why they even thought about installing the best locking mailboxes. It is always better to take precautions instead of regretting later. Anyone can reach to the traditional mailboxes and reach to your personal details. The people living in the United States are completely aware of identity theft as it has result in some people to lose a hefty amount of money. That’s why it is a big deal for the people who get their credit card bills and other important financial bills through the mail. So, if you want to stay protected from this kind of fraud, then installing a locking mailbox is the best thing that you can do. This product is way heavier and tougher than a normal mailbox. They only have a small space from where only mails can enter the box, but it is impossible to open it without a key. It means you will no longer have to worry about the noisy neighbors and trespassers. However, the real question is about selecting the best one. There is a range of locking mailboxes available in the market that makes it pretty difficult to choose. 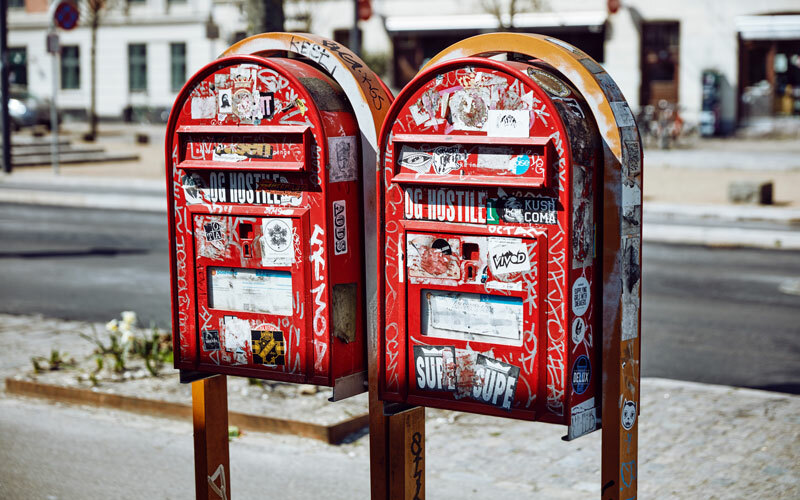 In order to help our readers, our team has gone through deep research and find out the top 10 locking mailboxes for you. It will help you in selecting the one that suits your needs and budget. Read the article carefully and then make your decision. As per their name suggests, they are the boss of locking mailbox industry. They have made their sole focus only on manufacturing high-quality mailboxes for their customers. All the products manufactured by Mail Boss are approved by the United States Postal Service. This model of the company is manufactured by using 14 gauge and 16 gauge electro galvanized welded steel that makes sure it will never break even by hitting with a sled hammer. Moreover, you will barely see a dent in its body. There are two openings in this mailbox, one for incoming mails and another one for taking it out. The incoming part has adequate space for a small package. However, the opening is too small that a person can’t even enter their finger in that from outside for pulling an envelope back. Another amazing feature of this mailbox is that it can’t be opened forcefully with a piece of blunt equipment. The company has employed an anti-pry latch design in this product. In addition to that, the mailbox is equipped with a 12-disc water lock having three keys. That’s why it is impossible to break the mailbox for taking important papers out of it. However, you should take care and keep your eyes in a secure place. The mailbox can be suspended easily on a present steel rod or wooden pole. It comes in four different colors Black, Bronze, Granite, and White. Made from electro galvanized welded steel for providing protection against vandalism. The engineered opening is wide enough for packages but too small for fishing. Anti-pry latch design prevents force entry with a crowbar. You can choose from different colors as you wish. It isn’t a waterproof product so water can enter the box. The key can get jammed inside this mailbox. Another amazing creation by Mail Boss, it is a unique type of mailbox that can be installed on a wall. You can also hang on the porches as per your convenience. It will make sure your mails remain near to the home that provides extra security. The company has used high-quality 14 and 16-gauge electro-galvanized steel for manufacturing this product that makes sure it stays protected against the vandalism. Setting up a wall mount mailbox is a little tougher than fixing a box on a post, but there is nothing to worry if you choose to shop this model of the company. It comes to the innovative mounting bracket due to which you can install it quickly and easier. In simple words, we can say that Mail Boss 7160 can be installed on almost anything, whether it is a brick wall, wood, stucco or any other thing that came to your mind. The design of this mailbox is almost similar to the first product mentioned in this list. It is equipped with a patented anti-pry latch system so it can’t be broken through force. This system has 12-wafer disc lock that can prevent all types of leveraged entries. Furthermore, this device can easily protect your mail in pretty harsh weather. So, if you are living in the rainy or hilly areas where the weather can change anytime significantly, then you can go for this one. 14 and 16-gauge electro-galvanized steel makes it a very solid product. This equipment is very easy to install and doesn’t demand proficiency due to mounting brackets. This is a portable device that can be installed anywhere. Anti-pry latch design makes sure no one can steal your mail. The mailbox is completely resistant to rain or snow. Some nuts and bolts of this locking mailbox are made up of low-quality material. Thieves can rip off this mailbox from the wall by using tools, such as a hammer. Epoch 7106 is one of the latest and advanced mailboxes available in the market. It has a range of unique features that make it a much-buy product. It is made from 12 and 14-gauge electro-galvanized steel that is much stronger and durable than the 14 and 16-gauge steel used in the previous mailboxes. If the first two doesn’t impress you, then this one will surely make you feel like investing money in this product. This mailbox is available in four different colors that allow you to buy one that matches your taste and looks of your house. You can choose from colors, such as Black, Bronze, Granite, and White. One of the most amazing things about this beautiful box is that it comes with the adequate amount of space that is capable to store mails for up to 4 weeks, depending on the load. However, it doesn’t mean that the incoming mail slot should also be bigger as it only has a space that allows parcels to enter the box. There is no way that anyone can put their inside the box through that space. The superior anti-pry latch system makes sure that it doesn’t get broken without a key, even with a crowbar. There are patented Fast-Trak Mounting Plate in this wonderful mailbox that will allow you to install it within a short span of time. Furthermore, it has a powder-coated finish that allows it to withstand strongly against the weather. It is a fully durable product that is made up of using high-quality material. Availability of a great range of colors that allow you to find the appropriate one. The box comes with a big place that can store many mails. Forced entry isn’t possible in this product due to the anti-pry latch system. It can be installed easily due to fast-track mounting plate. Completely resistant to the tough weather conditions. They should make the outgoing slot a little wider than the present one. The weight of this mailbox is around 40 pounds that are too heavy. However, it isn’t a bigger issue for the people. One of the most secure mailbox in this list, Mail Boss 7500 comes with many useful features that you will never find in any other product. Along with having approval from USPS, all the models of mailbox offer something extra to the buyers. It is a high-quality product manufactured by using 14 and 16 gauge electro-galvanized steel that can keep your mail secure from any kind of dangers. The most amazing feature of this product is its uniqueness in terms of compartments. Every Mail Boss’s mailboxes on this list come with an outgoing mail slot, but this one doesn’t have one. In this mail, you have to stick the mail on the side of the box and open it by clipping on the other side of the box. It can be a pretty serious disadvantage for some people. The company has used standard Mail Boss baffle door design in this program that makes sure you have enough space for packages as well as envelopes. Furthermore, the narrow opening guarantees that suspicious hands can’t reach down and grab your mail in any possible manner. Along with that, the same anti-pry latch system is used by the company for preventing vandalism. Also, it can be installed effortlessly with the help of patented Fast-Trak Mounting. There will be no need to call any professional for setting up this mailbox. Even a beginner can set up this mailbox in their home. Product is approved from USPS that is a sign of relief. Complete protection from all types of dangers. Fishing can be prevented due to the Baffle door design. Anti-pry latch design to prevent forced entry. The box doesn’t have a slot for outgoing mail. You’re going to have to stick it outside the box. Reinforcement plate on the top of the box prevents larger packages from fitting. The most amazing thing about the Gibraltar Mailboxes is their affordability. There will be no need for putting immense pressure on your pocket if you choose to shop Gibraltar MSK00000. It is a perfect option for medium-class families who don’t want to invest more money to buy the most secure mailbox. They may not be like the Mail Boss mailboxes in terms of features, but still, they are capable enough of protecting your mails from fraudulent. The company has manufactured this model by using pure aluminum that offers great sort of protection and can’t be broke away even by using a heavy tool. There is no way that even a thief will get through this mailbox by any means. It can be used on curbs and porches as per your convenience and requirement. It can be either hang on a wall or you can suspend it on a post without any reason to worry. This mailbox is available in two beautiful colors, white and black that are loved by everyone. There are separate compartments for both outgoing as well as incoming mail. Furthermore, it has an indicator flag for telling mailman that you have outgoing mail. The upside of having an aluminum mailbox is that it never rusts. The powder-coated aluminum offers proper protection against corrosion. Extremely affordable that fit everyone’s budget. Aluminum body will make sure thieves stay away from your mails. You could hang this mailbox on both curbs as well as porches. Availability of two different colors. Indicator flag for marking outgoing mail. The mailbox remains protected against the rust. The aluminum body isn’t the best material to protect your mail. The mailbox should have more space for incoming mail. People complain about the poor quality of some parts in this mailbox. Without any doubt, the Gibraltar DMVKGV04 is one of the best one on this list due to its affordable price and tremendous features. It is a stylish mailbox that will surely add beauty to your home and allow it to look great. This mailbox might be a low-cost option, but still, the company hasn’t compromised in terms of quality. They have used pure electro-galvanized steel for making this box to ensure its durability. They have plated the outer body with Venetian Bronze that has a beautiful look and blends perfectly with all types of walls. Furthermore, the Venetian bronze used in this product provides complete protection to the case against corrosion and rust. The complete mailbox has been designed and manufactured in the United States that prove its quality. Another best feature of this product is the low weight that makes it easier to transfer from one place to another. The company has added two coverings in this mail prior to the main mail compartment for making sure your mails stay protected. First one is located on the top of the mail slot to protect your documents from the rain. After the removal of top coverings, there is a mail slot and a lock. The mail slot is pretty small and can’t hold anything other than envelopes. The second covering opens when it is unlocked via a key. After that, you can now take out your mail. This system proves that it is the best secure mailbox available in the market at a cost-effective price. Manufactured by using electro-galvanized steel for protecting the box from vandalism. Venetian bronze not only looks good, but it also helps to prevent corrosion. Manufactured entirely in the United States. Truly resistant to all weather conditions. The mail slot is too small that makes it inefficient for big envelopes. The bronze finish isn’t best in terms of durability. There are some complaints about its faulty keys, but it is in minority numbers. Architectural is a popular name of the mailboxes manufacturing field. They are known for designing and creating some unique type of mailboxes as they don’t only focus on making their boxes safe, but also try to make them beautiful and stylish. The Geneva Locking Mailbox is manufactured by using heavy gauge aluminum and electro galvanized steel material that protects it from vandalism and provides security against rusting and other climatic effects. The mailbox sells this product in four different colors, such as Black, Bronze, Sand, and White. The best feature of this mailbox is its huge size. For some people that is a disadvantage as it can’t be mounted on a regular post with bolts due to this. In order to deal with this, you have to buy the 4 x 4 plate from Architectural Mailboxes as they are the best option for keeping this mailbox secure. It is available in same matching colors. The mailbox has one of the largest delivery doors. This is perfect for people that want to be able to receive huge packages. The intricate design of the Geneva has a wide opening but no one could stuff their hand inside. The front opening of the mailbox has a concealed mail clip and outgoing mail indicator. One more thing about this box is that has two openings for taking out your mail. There is a smaller compartment on the front and a second larger door on the back. The mailbox looks beautiful on the curb of any home. Manufactured with heavy gauge aluminum and electro galvanized steel that provides proper security. Available in four different colors for customer’s choice. Large interior delivery door and incoming mail compartment make it perfect for big parcels. Concealed outgoing mail clip and indicator flag ensures the third person can’t put their hands on your documents. Two different compartments for taking out mails efficiently. The mailbox can’t fit on a generic post without a specific mounting plate. The big size of this mailbox might be a problem for some people. It is possible for sticking a crowbar in the rear compartment. Another amazing creation by Architectural Mailboxes, this can be perfect for the areas with rough weather. In short, we can say that you can give ultimate protection to your mail by installing this equipment in front of your house. The 6200B Mailbox is a Postmaster General approved mailbox and comes with a heavy-duty body that provides complete protection for your documents. Made up of heavy 16 and 18-gauge galvanized steel, this mailbox can protect your mail securely from the not-so-discreet mail thieves. There is a powder coating on the box to make sure it remains free from rusting. Weather resistance is a huge benefit of this product for the customers. The doors have rubber seals to make sure that your mail doesn’t get wet. All the material used in the making of this mailbox is anti-corrosive. The entire outer body is a single piece of metal which also prevent moisture from reaching the mail. It comes in three different colors; Black, Graphite Bronze, and Sand. Just like the previous one, this one also needs to be fixed in their post with the special mounting plate. Also, this box is quite spacious as its interior compartment can hold up mails for up to 4 weeks easily. Furthermore, the receiving mail slot is large enough for accepting large packages. Mailbox is approved by Postmaster General that gives a huge relief to the customers. High-quality 16 and 18-gauge for preventing vandalism. Anti-corrosive and weather resistant making it perfect for rainy areas. Rubber seals to protect the mail from the rain. Really roomy interior compartment and receiving slot. The mailbox can be opened by using a crowbar. A very thin hand can enter the mailbox. CastleBox 88687 is one of the most costly mailboxes on this list that might make think people twice before buying it but is also the safest place for keeping your mails safe. The top-class features of this wonderful product do justice with its price tag. This product is made up of heavy-duty 12-gauge galvanized steel having powder coated finish for lasting durability. It is guaranteed that no one can become successful in breaking into this mailbox. The 88687 is the perfect box for protecting the mail from getting wet. The 1” rain guard overhang ensures that your mail remains warm and cozy even if it is pouring outside. The most amazing feature of this mailbox is a special three-digit lock that can be changed as many times as you want. If you don’t like the digital lock, the box also has a manual lock having two keys. You can easily replace the digit lock with a regular lock. Another good thing about this mailbox is its large space. If you are one of those people who travel a lot, then this box is certainly made for you. The box is large enough for storing prescription drugs, magazines, checks, and even some big packages. You can hang this box on a wall securely or even suspend it on a post. It has mounting holes that allow you to install it anywhere. High security due to the Heavy duty 12-gauge galvanized steel that makes sure that no one can get in the wrong way. Complete protection against the rain with 1” guard. Three-digit lock with a combination that can be changed as often as you like. Replaceable lock and key included. Large space for storing pretty huge parcels. Can be hung on a wall or suspended on a post. Our team researched for hours to find out a flaw in this product, but believe us it only has happy customers all over the internet. If you’re looking to buy an affordable mailbox, then this option mightn’t suit you. However, people want an impeccable option should go for this product. The most amazing features of this mailbox are its size and receiving mail slot. The secure-drop door has enough space for all types of packages without a problem. The dVault box has enough space for storing several weeks of mails without any problem. You may think that the wide opening creates a problem and people are going to get their hands on your mail. But, you don’t need to worry because the intricate design of your mailbox prevents them. The mailbox itself constructed with 16-gauge electro-galvanized steel and we all know how good that is to prevent people from breaking in. The anti-pry door and Posi Keyed lock make sure that no one can get in forcefully. The mailbox is designed and manufactured in the United States. The box comes in five different variety of colors; Copper Vein, Black, Grey, Sand, and White. Secure-drop door provides enough space for packages but prevents fishing. The large storage area can store a ton of mail. Constructed with 16-gauge electro galvanizes steel. Anti-pry door design for protection against crowbars. You can choose from five different colors. The mounting plate isn’t as heavy and strong as it needs to be. We have already discussed some best locking mailboxes available in the market. Now, we will tell you some common qualities that you should check while purchasing one. If you’re a pro, then you probably know what you’re looking for. However, if you are a beginner, then you should be more cautious while selecting the best one. You will learn all the things needed to buy the perfect one. Should You Buy Curbside or Wall Mount Mailboxes? If you ask, there isn’t a big difference between them. Both of them are useful in their own way. Curbside boxes are pretty bulky and have large space, but there is a need for mounting plate and post to hang them. This costs some extra money and effort from your side. On the other hand, the wall mount is pretty easy for setting up, but they don’t have that much space. Curbside will be getting a ton of dust and rain so they need to be durable. Wall Mount mailboxes can be cheap because they don’t have to withstand a higher amount of wear and tear. How Much Mail Do You Get Regularly? Mail space is one of the main factors affecting mailboxes. The majority of mailboxes are pretty spacious while others aren’t. Manufacturers like Mail Boss typically make huge boxes while Gibraltar makes smaller boxes. You need to think about your requirement and buy a box according to that. If you travel often, then make sure you buy a pretty large box because your mail will need to be safe until you come back. How Much Should You Pay for Mailboxes? Mailboxes range anywhere from $30 to $1,000. Each mailbox came with its own set of features and you should consider a few things before spending money on the box. The cost depends on what type of mail you get and the level of protection you want. If you only receive normal envelopes and a few bills, then a mailbox less than $100 will suffice. But, if you get prescription drugs, cheques, and packages on a regular basis, then you should go at least over $300. There are many places around the world where mail theft isn’t a big concern, but the Americans aren’t one of them. So, you should about investing your money in one of the best locking mailboxes to keep your mail safe. You will be able to keep your records clean and protect your identity in this manner. So, what are you waiting for? Go ahead and buy one that suits all your requirements.